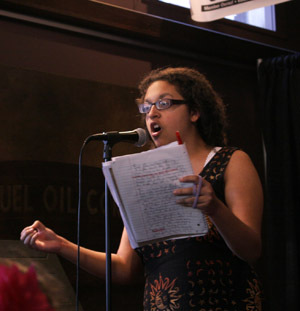 SLAMCAMP poet boldly shares her soul at Pittsfield’s WordXWord Festival slam 2013. On my way to the first day of SLAMCAMP, I had plenty of time to doubt myself. What if the kids don’t like me? What if I can’t control their behavior? I’ve never actually slammed before… how exactly am I qualified to teach it? What if nobody shows up? What will I do if someone says something problematic? How am I going to do this by myself? By the time I arrive, I am an emotional mess. I take a deep breath, set up the room, and wait. SLAMCAMP was simply the best thing I could have done with my summer. Running SLAMCAMP was an intense learning process for me. I had to apply for the grant by making a budget and creating goals for the program. I wrote the curriculum and planned out the snacks and transportation and guest poet workshops. I also had to make a case that the program was designed to bring about social change. But the most terrifying part for me was the actual facilitation of the program. I’ve always been the second-in-command, the support. This time, I was the one in charge of everything and the person keeping the whole program running smoothly, and at first I was quite doubtful of my ability to do so. But I will never forget how relieved I felt when the young poets came bursting through the door that first day. Their excitement filled up the entire room. Ten young women participated in SLAMCAMP. They all come from working class or poor families. A few had experienced life in the foster care system and homelessness. They all had beautiful tales to tell and songs to sing. The program culminated with our participation as poets (not “youth poets” but “poets”) in Pittsfield’s WordXWord Festival poetry slam, and the night of the preliminaries was the best! We were in it together. The girls laughed and cried and shook in fear together. They slammed together and cheered louder than anyone in the audience for not only each other, but the other poets that they were competing against. Elizabeth’s poem, “Mapping Out Vaginas For Boys,” received so many laughs after every line that it put her over the three-minute time limit. Skye made it to the semi-finals with her touching poem that got a high score from even the toughest judge. I watched Jeannette’s entire face light up when her favorite poet, Jon Sands, gave her a hug and told her how much he loved her piece. It is moments like that that make the program truly worth it. Thanks, Crystal, for sharing your experience—and welcome to the network. We are glad you are here! Crystal Hope Garrity discovered her love of education and creative writing at the Berkshire Arts and Technology Charter Public School in Adams, MA. She is currently a senior at Hampshire College concentrating in Poetry, Photography, and Education and interns for the Youth Action Coalition in Amherst.